Wearing the requisite hoodie and sandals, Saturday Night Live comedian Andy Samberg opened the F8 developer's conference Thursday by impersonating Facebook CEO Mark Zuckerberg, a 7-minute comedy bit that preceded the actual one-hour keynote. Samberg began by stating his earnest intention to discuss "some key issues." "The first is the importance of authentic identity: I am Mark Zuckerberg," said Samberg, placing his right hand over his heart. "And under this sweatshirt are rock-solid, cut-and-greased abs." Fake Zuck then went on to talk about user growth, bragging that Facebook now has more members than the population of Europe, the cast of Glee, and the number of people "who claim they came up with Facebook--BURN!" So how many members does Facebook have exactly? Don't ask, Samberg warned: "Myspace asked a lot of questions, and I chloroformed it, drove it out to the desert, and put a bullet in the back of its skull." Facebook's focus has shifted from user growth to user engagement and sharing, Samberg told the gathering of developers and media. "You wake up, share it with your friends. You're out of toothpaste, share it with your friends. You take a crazy, big number-two, don't share it with your friends. That's for Twitter." Yep, big laugh after that one. 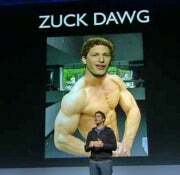 Fake Zuck then announced some innovative (and fake) Facebook features, including a new section in your list of friends. "It's called, 'I'm Not Really Friends With These People,'" joked Samberg. "It's the perfect place to put awkward classmates from middle school, older drunk women you meet at charity events, racist neighbors, and aunts." This section, he added, "let's everyone know 'I don't want to be associated with these guys, but I can only ignore them for so long.'" And then there's the bogus new feature called the "Slow-Poke." "It's the only poke that takes 24 hours to reach the person you send it to," said Samberg. "So you have a full day to sober up, realize you're an idiot, and retract the Poke. The Slow-Poke: Because any dude who's had two beers becomes a raging horn dog." The real Mark Zuckerberg joined Samberg for the final three minutes of the segment, which consisted largely of goofy banter between the two. One funny bit: Samberg parodied actor Jesse Eisenberg's twitchy, mumbling performance as Zuckerberg in "The Social Network," last year's feature film about the founding of Facebook.